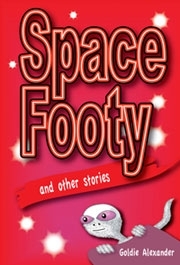 Space Footy and other stories, a book for boys aged 9-13 years, (I’d say people aged 9- 100) is the companion to the previous book of entertaining tales for girls of the same age group, My Horrible Cousins and Other Stories. It covers various genres including science fiction, mystery, adventure, historical fiction and humour. Ghosts, aliens and bullies are only a few of the main characters the stories are built upon. There are contemporary issues addressed and handled in a comprehensive but subtle way. My favourite of all the eleven stories, although each one has merit, was Freaky. Imaginative and meaningful, it tells the story of an inter-galactic boy, Jay, ‘found under a cabbage patch’ who was ‘a freak, an idiot, or both’, as he had an extra head ‘that hung from his left shoulder like a dead weight’. Cloned in a fertility lab, his origins had been kept secret. But he’d inherited the gift of inexplicable strength, and a step-father who adored him. Forced to land on the asteroid Salisia, his planet of origin, Jay and his father Bruth meet Beyong, a boy always on the run because he refuses to tell a lie. Jay is told never to be separated from Bruth no matter what occurs. As he grows, so does his head. It is the explanation of the unnatural circumstances of his form that explodes into crystal-like perfection at the climax of the story. Goldie has a gift for drawing in the reader at the beginning with a little unexpected twist that promises excitement and something unusual. The whole of the collection and the previous one have this sustainment. The characters are unconventional; but they have something specific that’s extraordinary about them. They do outrageous things, have significant setbacks, but every story ends in a positive outcome. Teacher Notes are available for both collections as with all the author’s works.